Accept then, most clement Prince, this gentle glory reserved by the stars for you. May you long enjoy those blessing which are sent to you not so much from the stars as from God, their Maker and their Governor. 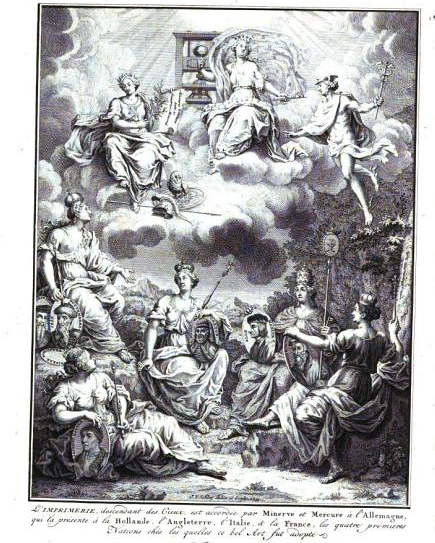 Prosper Marchand’s frontpiece on Histoire de l’origine et des primiers progrès de l’imprimerie (1740) shows the spirit of Print descending from the heavens under the aegis of Minerva and Mercury, towards representations of the “true” originator of the printing press: Gutenberg, Fust, and (a blank) Schoeffer for Germany; Koster in the hands of Holland, Caxton for England, Manutius for Italy, and Estienne for France. The painting captures both the problem of crediting the “true” inventor, and the argument for a culture of reception for the transmission of scientific knowledge. From the “age of incunabula” to the arrival of the printing press, print revolutionized, and “altered both the inception and dissemination of knowledge.” For the historian, the relationship between print and knowledge contains a complex history of the social construction of a medium towards the transmission of knowledge (Thony C. also recently discussed the relationship between artistic representation and scientific illustration within developments made in print technologies).Print’s most relevant contribution to the transmission is through its apparent “standardization,” a notion captured by Elizabeth Eisenstein’s term “fixity,” referring to the duplicative powers of print and its preservation; by “fixity,” the validity of the text could be guaranteed, and scholars “were freed from spending their lives eradicating scribal mistakes.” Yet “fixity” only goes a long way capturing the history of print, since it is not an inherent quality, but a transitive one, comprehended only within the social construction it embodies, among elements such as openness, patronage, credit and trust. With the rise of status of the artes mechanicae, fifteenth-century writing on mechanical arts expanded, especially in Italy and Germany, and elevated due to a changing political culture in “which the legitimacy of rulership was increasingly supported by the construction arts.” This brought about a new alliance of techne and praxis, and the production of the mechanical arts significantly influenced the culture of knowledge through highly illustrated and textual treatises, many dedicated to patrons. During the “last scribal age,” Latin manuscripts on machines and devices embodied a highly illustrative style, with little evidence of secrecy within them. Fifteenth-century German writings on gunpowder artillery and machines were also lavishly illustrated, with a wealth of technical information and emphasis on the transmission of the technical aspects of the treatises. While Latin manuscripts were written for the reader with a technical background, German technical texts demonstrate a shift in readership, towards elite collectors and a culture of reception far from “low-born.” It is interesting to note that the highly technical treatises were not highly guarded state secrets, especially the Latin manuscripts, especially since many of them contained extensive technical details that encouraged reproduction. One argument could be that the culture of reception played a key role in the use and interpretation of those technical treatises; the reader, who picks up a copy and understands it, is often a reader with a technical background. As Adrian Johns argues, the texts do not arrive with build-in interpretations, and while it cannot compel readers to react in certain ways, “they must be interpreted in cultural spaces the character of which helps to decide what counts as a proper reading.” The possibility of secrecy is inherent in manuscripts and oral traditions, a reflective of the social structure and the need for a secure transmission of ideas.Another argument is that secrecy was somewhat prevalent, if only through the guarding of certain aspects of knowledge, to control the means of interpretation. The Pythagorean code of secrecy, for instance, tried to maintain a valuable source of knowledge within the restricted circle, to prevent a misuse of a type of knowledge that required rigorous discipline. There was something about possessing a type of knowledge that was restricted to an elite group, to control the means of interpretation. Paracelsus, for example, wanted to restrict his readership to the “common people,” while others, like Biringuccio, scorned pseudonymous authorship, and derided craft secrecy to prevent fraudulent use and suggestive expertise that did not exist. Others still, added encryptions or cryptographs in their texts, though they were used more so for the author’s own interests than secrecy. Furthermore, manufacture crafts still maintained elements of secrecy, as the secrets of their craft was beneficial for economical implications; such is the case of the Venetian glassmakers, who highly guarded the secrets of the trade, and maintained to keep the trade restricted to the city. A new shift towards interpretation arrived with the printing press and the commercialization of knowledge, as patronage authorship and court culture allowed for a new kind of authority over knowledge, especially scientific knowledge. Tycho Brahe, famously known for personifying the role of print and rendering natural knowledge universal, isolated his works in the print house at Uraniborg, and this isolation meant that he could produce whenever, for whomever, and on whatever he desired. Yet, some of his texts, such as the Astronomiae Instauratae Mechanica (1598) were distributed as gifts to patrons at courts and universities, for a readership that “undertakes a distinctive system of practice and ideas.” As Johns explains, “the giving and receiving of such gifts was an important part of court culture, enmeshed in conventions of status recognition, reciprocation and reward.” This recognition is not prevalent only with the advent of the printing press. Keyser’s Bellifortis, for example, was written as a prince’s book, dedicated to the emperor Ruprecht. Yet patronage did not guarantee proper reception of idea, or allowed scientific aims to be achieved. Such is the case of Galileo, who angled to enter the court of Cosimo II de’Medici, where court patronage only provided reasonable criteria to be adopted for authorship. As Johns explains, there was no “Galileo, scientist,” outside this cultural realm, manipulating the mechanics of nature, but only a scientist depending the high esteem of the court and his ideas to be interpreted as he wished. The last of Galileo’s work, his Dialogo, depended heavily on the smooth transitive skills of his ally Ciampoli, whose later fall from grace could not prevent a misrepresentation of the text. Pope Urban, already under fire from Spanish interests, did not read the Dialogo within the context Galileo desired, and “what might otherwise have been appreciated as witty dialogue sallies came to be read very differently.” Demonstrated by the cases of Tycho Brahe and Galileo, there is no evidence for uniformity, or “fixity” within a culture of reception. As one of the earliest nations for the commercialization and adoption of “intellectual property,” England faced many hostile conflicts about propriety and credit rights, especially within context of the legal debates between the Stationers’ Company and advocates of royal patents. Booksellers and printers were often perceived as manufacturers of credit, but they could not always guarantee credibility of textual evidence. Galileo’s commercial printing of Sidereus Nuncius immediately released unauthorized copies (Frankfurt, 1610), including hastily reproduced images of his detailed drawings of the moon. English courtly life, in addition, did not portray the absolutism over knowledge as presented in Germany or Italy, and “secure” transmission of knowledge was dependent on the Stationers’ Company, as well as those ordained by royal patents. With bookmaking established as a craft,”[ k]nowledge itself, inasmuch as it could be embodied, preserved and communicated in printing materials, depended on Stationer’s labours,” and control of the trade intensified through the notion of propriety. The Register Book of Copies (the Stationers’ “Hall Book”) was one way of ensuring propriety disputes, but problems still rose through “blocking entrance” strategies, most notoriously by Peter Cole. Yet conflicts still ensured, especially in cases over claims over inventions not registered, or registered but not yet produced, and especially in a highly tensioned atmosphere filled with charges of plagiarism, most prominent within the experimental philosophers of the Royal Society of London, and their aggressive approaches to print. How was one to “trust the print,” especially for its propagation of scientific knowledge? It is apparent this trust is largely dependent on its culture of reception, especially in solving problems of piracy, forgery, and “usurpation.” The validity of the text’s trustworthiness was probably not solved until the establishment of copyright laws in the eighteenth century, and though the meaning of ‘print culture,’ is no easy task for the historian, it at least encompasses a great source of cultural transmission of scientific and technical knowledge over hundreds of years through numerous national borders. Adrian Johns presents an interesting argument, by looking at the problem of finding the “true” inventor of the printing press. For Johns, this identification is an important topic in defending local, national and personal identities within the conflicts, and he even argues that the history of print, and the credibility of the text could not be fully established until the inventor was crystallized (The Nature of the Book (Chicago: University of Chicago Press, 1998, 375). L. Pyenson and S. Sheets-Pyenson, Servants of Nature (New York: W.W. Norton & Company, 1999), 212. Eisenstein describes the arrival of “standardization” with the invention of the printing press, which was able to allow a steady production of “standard” editions, and demonstrate a “new capacity to locate textual errors with precision and to transmit information simultaneously to scattered readers of knowledge (The Printing Revolution in Early Modern Europe (Cambridge: Cambridge University Press, 1983), 51). However, Eisenstein points out medieval scribes were incapable of committing a “standardized error,” in which a compositor’s error would be widely spread by mass production. Such an example is the so-called “wicked Bible” of 1631, where the word “not” was dropped from the Seventh Commandment (Thou shalt not commit adultery). E. Eisenstein, The Printing Press as an Agent of Change (Cambridge: Cambridge University Press, 1980), 113. Johns, The Nature of the Book, 19. P. Long, Openness, Secrecy, Authorship (Baltimore: The John Hopkins University Press, 2001), 17. Long, Openness, Secrecy, Authorship, 24-25. Long, Openness, Secrecy, Authorship, 25. Long, Openness, Secrecy, Authorship, 35-37. Long, Openness, Secrecy, Authorship, 175. Long, Openness, Secrecy, Authorship, 102. Long, Openness, Secrecy, Authorship, 103. Long, Openness, Secrecy, Authorship, 115. Long, Openness, Secrecy, Authorship, 117. It is also worthy to note that oftentimes credit was given to those other than “low-born,” not simply by virtue of their status, but also because of the marketability of creating a grand myth. The story of the credit of the Greensleeves composition to King Henry VIII comes to mind, a myth that stood through many years. Eisenstein also speaks of this propensity, as does Johns in his narrative of Dr. Faustus. E. Eisenstein, The Printing Revolution in Early Modern Europe, 30-31, and Johns, The Nature of the Book, 333. Johns, The Nature of the Book, 20. Long, for instance, mentions that secrecy was prevalent in crafts that contained magical implications, or those manufacture crafts that were beneficial for economic gains. However, she is careful to warns us that the “issue of craft secrecy in the ancient world is best approached with caution: lack of evidence does not mean that it did not exist. Yet the assumption that widespread craft secrecy prevailed is not justified” (Openness, Secrecy, Authorship, 74). Long, Openness, Secrecy, Authorship, 57. Long, Openness, Secrecy, Authorship, 165. Long, Openness, Secrecy, Authorship, 180. Febvre and Martin, for instance, argue that the introduction of printing was only a “road to our present society of mass consumption and standardization,” though the print’s revolutionary implications did not have a radical transformation on the culture of reception’s immediate acceptance of it (L. Febvre & H.J. Martin, The Coming of The Book (London: Verso, 1997), 260. Johns, The Nature of the Book, 10. Johns, The Nature of the Book, 14. Johns, The Nature of the Book, 14-15. Johns, The Nature of the Book, 15. Long, Openness, Secrecy, Authorship, 106. Johns, The Nature of the Book, 24. Johns, The Nature of the Book, 27. Johns, The Nature of the Book, 48. Johns, The Nature of the Book, 68. Johns, The Nature of the Book, 218. Johns lists a few examples: William Harvey (accused by Walter Warner), Isaac Newton (by Robert Hooke), Robert Hooke (by John Flamsteed), Robert Boyle (by George Sinclair and John Aubrey), Edmond Halley (by Flamsteed and before the Royal Society, by Hooke), James Harrington (by anonymous antagonists), Thomas Hobbes (by John Wilkins), John Woodward (by John Arbuthnot), and John Wallis (by almost everyone [!]) (Johns, The Nature of the Book, 461). How could anyone be taken seriously if there were charges of plagiarism being thrown from every which direction? I finally found time to read this and it’s a nice summary of a difficult and contentious topic. Although I think Johns is correct in his criticism of Eisenstein’s ‘fixity’ I personally think that the printed text reached a level of trust fairly early in its history despite all of the problems that Johns lists. The question for the historian of science should be why did people trust printed texts despite all of their obvious failings?